Jimi Hendrix ✅ NETENT Slots Game App: Play For Free or Real Bucks. In the past, software developers used to release basic music themed games. However, over time, they began to feel the dissatisfaction from players hence they decided to up their game by developing slots with more creative and innovative themes. One strategy employed to address this challenge was to develop branded slots which are based on popular movies, big rock stars like Jimi Hendrix or other well known rock legends like Motorhead. One great branded slot game is the Net Entertainment powered Jimi Hendrix slot which pays homage to one of the most prolific American guitarists of all time i.e. Jimi Hendrix. To learn more about this online slot, continue reading this review. Before you go play it for free or real, just remember that this slot comes with five reels and 20 flower power paylines. The background of this slot game depicts a cartoon-illustrated countryside landscape. The reel section is covered by a decorative brown wall. When spinning the reels of Jimi Hendrix slot game, players will find the following symbols on the reels: Jimi Hendrix himself, brown and red guitar, white guitar, circular instrument, heart icon, a flower, a disc, and eye and traditional poker symbols. Jimi Hendrix and the brown and red guitar: The highest paying symbols are Jimi Hendrix and the brown and red guitar. For matching five of the same kind the player wins 400 credits, for matching four of the same kind the player wins 100 credits, for matching three of the same kind the player wins 20 credits and for matching just two the player wins 2 credits. White guitar: The second highest paying symbol is the white guitar. For matching five of these the player wins 200 credits, for matching four of these the player wins 85 credits and for matching three of these the player wins 15 credits. Circular instrument: The third highest paying symbol is the circular instrument. For matching five of these the player wins 150 credits, for matching four of these the player wins 70 credits and for matching three of these the player wins 10 credits. Heart icon: The fourth highest paying symbol is the heart icon. For matching five of these the player wins 125 credits, for matching four of these the player wins 60 credits and for matching three of these the player wins 10 credits. Disc: The fifth highest paying symbol is the disc. For matching five of these the player wins 100 credits, for matching four of these the player wins 50 credits and for matching three of these the player wins 9 credits. Flower: The sixth highest paying symbol is the flower. For matching five of these the player wins 90 credits, for matching four of these the player wins 40 credits and for matching three of these the player wins 8 credits. Eye: The seventh highest paying symbol is the eye. For matching five of these the player wins 80 credits, for matching four of these the player wins 35 credits and for matching three of these the player wins 7 credits. Traditional Poker Symbols: These pay the lowest. For matching five of a kind the player wins up to 75 credits, for matching four of a kind the player wins up to 30 credits and for matching three of a kind the player wins up to 5 credits. Wild: The wild is represented by Jimi Hendrix. Scatter: The scatter is represented by Jimi Hendrix in white playing the guitar. Purple Haze Feature: This feature is activated when the purple haze symbol pops up on reel one. When triggered, all traditional poker symbols and also the purple haze symbol will transform into wilds for the next spin only. Red Guitar Re-Spin Feature: This feature is triggered when at least four red guitar symbols pop up on the reels simultaneously. When activated, the player receives one re-spin. The player can retrigger the re-spin if he lands at least one red guitar symbol. The feature continues for as long as the player keeps landing the red guitar symbol. Pick and Click Feature: This feature is triggered when the player lands at least three scatter symbols. Once triggered, the player plays a pick and click game. To play the game, the player has to click on the loudspeakers present on the screen. The player will win the prize corresponding to the first three identical symbols that he reveals. There are four prizes that can be won which are the coin win, Crosstown Traffic Free Spins, Purple Haze Free Spins or the Little Wing Free Spins. Coin Win: This feature is triggered via the Pick and Click Feature. The player is asked to play a mini pick me bonus game and he stands a chance of winning a random multiplier which ranges from an 8x to a 30x multiplier. Crosstown Traffic Free Spins: This feature is triggered via the Pick and Click Feature. In this feature, the player is awarded 6 free spins. During the feature, reels alternate in transforming into wild reels. Purple Haze Free Spins: This feature is triggered via the Pick and Click Feature. The player is awarded between 6 and 12 free spins. In this feature, all traditional poker symbols transform into wild symbols. Little Wing Free Spins: This feature is triggered via the Pick and Click Feature. The player is awarded between 6 and 12 free spins. In this feature, there are at least three to five overlay wilds during every spin. James Marshall Hendrix born 27th November 1942 was not his real name by birth which was Johnny Allen Hendrix. Jimi was an iconic American rock guitarist, singer, and song composer. He was musically active in the following genres…. rock, psychedelic rock, hard rock, blues, R&B. Funny enough his most popular years in the business only amount to about 4 years in total, although he was active from 1963–1970. Jimmy was regarded as one of the most innovative electric guitarists in the history of music thus far as we know it. Jimmy lived life in the fast lane, he was well known to love a drink and take drugs pretty much all at the same time. Sadly Jimmy died in London on September 17, 1970 aged just 27 from what was described as a result of a drug overdose with complications caused by the prescription drug Vesparax, a barbiturate based medication that cannot be purchased in most countries these days due to it’s potency. 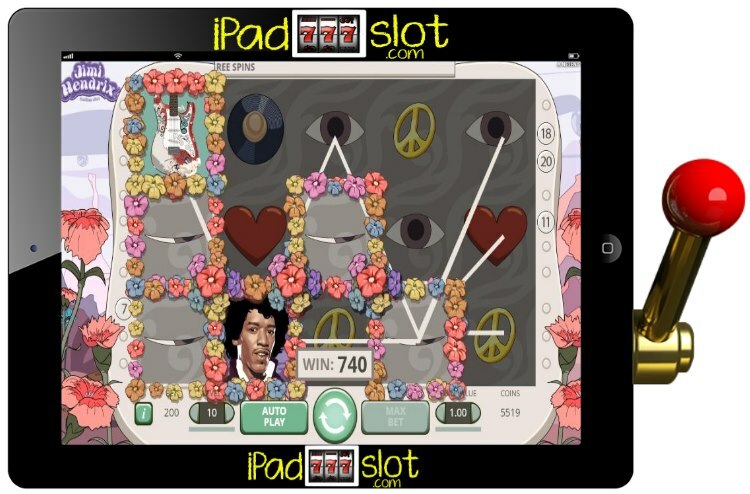 Jimi Hendrix is an absolute must play iPad, iPhone and Android slot game which comes with a nice assortment of bonus features. Out of a 10 point rating, this slot game gets a 9 point rating in our NETENT slot game guides.